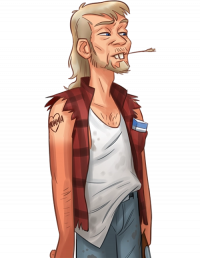 Clyde is a lanky redneck of a man with blond hair and blue eyes. He has a mullet haircut and poorly shaved beard. A heart‐shaped tattoo, dedicated to his "momma", is printed on his right arm. His outfit is composed of a loosy T‐shirt, probably white at first, but now grey and stained; old jeans; and a red‐black checkered jacket whose sleeves he himself cut off. He chews a sprig all the time. He is dumb as a stump. He lives in a shack near Roxxy and Crystal's trailer.